Even the free version of the Structure Theme now has responsive media queries for your iPhone — sweet! Change the link and highlight colors within the Theme Options. The free version now uses the Options Framework for managing the homepage layout and settings. Slick CSS3 transitions and animations have been added, providing a greater user experience. Facebook Like, Tweet and Google Plus buttons can optionally be displayed throughout the theme. Navigating through posts has been made much more efficient with numbered pagination. 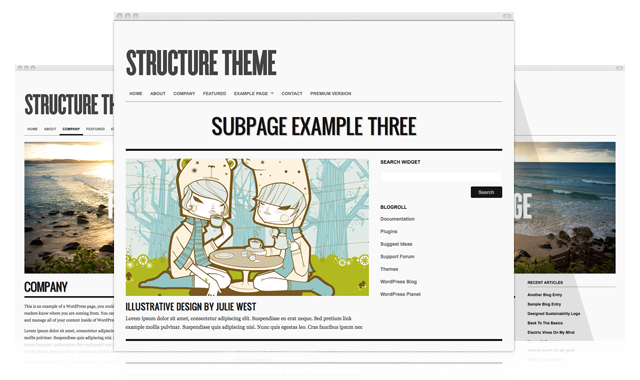 Countless other improvements have been made to this free version of the Structure Theme. How did you add the slideshow? Been trying to do it for days, a little new to this. The slideshow is a feature of the premium theme (which is what Asier is using), whereas the free version has a feature-image instead. If you have the premium version of the theme, then the slideshow is on the home page automatically (Under Settings –> Reading, in your WordPress dashboard, make sure the ‘show latest posts’ option is selected), and you can configure the slideshow via your theme options (Appearance –> Theme Options). If either of you have any further questions, don’t hesitate to ask on our support forums: http://www.organicthemes.com/support/forum.php. If I upgrade to this latest version for my site, will I need to recreate any modifications I have made to the stylesheet? Thanks for offering this as a free option. The Structure theme looks really good and I’m interested in switching to it-just wanted to make sure that I do have the option of displaying full length posts rather than abbreviated snippets in blog mode? Is it compatible with Buddy Press? is there an update to the premium structure them as well? How do you download the free version? It’s asking for a discount code? Under Settings –> Reading, set the ‘Blog Posts to display’ option to the same number (or less than) as you’ve set in your theme options. Thanks! that did it, im going to play around more with this theme,looks gr8. And the premium version really looks like it has its value so prolly will need to grab that once i do more playing with this version. Thanks, Jeremy! I found this page searching for the response to the question Shawn asked, and your answer allowed me to resolve the problem. Much appreciated! Hi. I stumbled on this page searching for the answer to the question Shawn asked. There’s no ‘Blog Posts to display’ option under Settings –> Reading. I’m using WordPress 3.4.2. Hoping for a quick response. Thank you. Am I correct is stating that the theme “Structure” does not have a infinite scroll’ feature? That is correct. The Structure Theme does not currently have infinite post loading. Can Any 1 Suggest Me For Free Templates ? Is this still free? Where and how can I download it? Thanks! The free version isn’t currently available as it needs to be updated again, so we’ve removed it until then. hoping to try free version; but (still) doesn’t seem to be available. You might still be able to get a download link by subscribing to our newsletter from our home page: http://organicthemes.com. You may still receive a download link if you sign up for the Newsletter. However, this theme isn’t recent so might require some updates. Our newest Swell Theme offers a free Lite version which you can find here: http://organicthemes.com/free-theme-swell-lite/. Is the theme still freely available? I cannot find a link to the download..